This is not one of my favourite shirts that I own. Something about Kappa shirts that really don't inspire me at all. Sometimes the designs are nice but the material they use is always going to be a drawback. This shirt follows a standard red and white vertical stripe design. One thing missing from this shirt which is common on most Spanish club football shirts is the presence of a flag of some sort. The club was established in 1905 with the name Sporting Gijonés, Anselmo López being the first club president. King Alfonso XIII accepted the Royal patronage of the club for the Spanish Crown in 1912, introducing the term "Real" (Spanish for "Royal") to its name, becoming Real Sporting Club Gijonés. 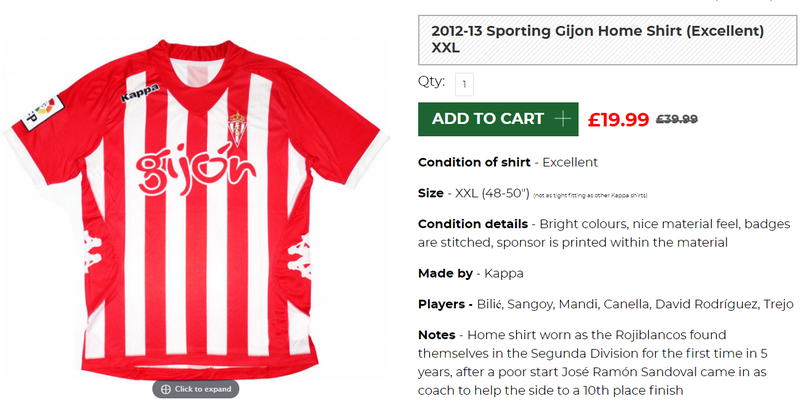 In 1916, a new change took place to adopt today's denomination, Real Sporting de Gijón. From 1941 until the 1970s, due to a temporary law forbidding the use of foreign words in football club names, the team's official denomination was Real Gijón.